EaseUS Data Recovery: It is an extremely easy and efficient data recovery software tool. This data Recovery tool from EaseUS described as “simple & safe to recover all lost data from different devices and platforms” which is purely applied and has a high frequency on working for such cases. It offers you to recover your lost data which you accidentally deleted, easy and quick emptying recycle bin, and ‘shift+delete’ command without backups. It can restore your files from a formatted partition, drive, and card as well. Recovery of your data from raw or inaccessible hard drive caused by any formatting error. It also has the ability to recover all data from lost partitions due to re-partition, boot manager, improper clone, system re-installation and disk accident. This Recovery software supports data recovery after a system crash due to any reason, virus attack, unexpected power off, or even from hard drive error or failure. This data recovery software tool from easus is compatible with all major OS like Windows which includes windows (10, 8, 7, Vista), Mac, Android, iOS. The Features you get on all these Operating Systems are pretty much same the only thing you will see different in these different OS is the Pricing which decides the number of features you are getting on easus recovery software. Data loss situations: You can recover formatted, inaccessible or deleted data from different data loss situations. 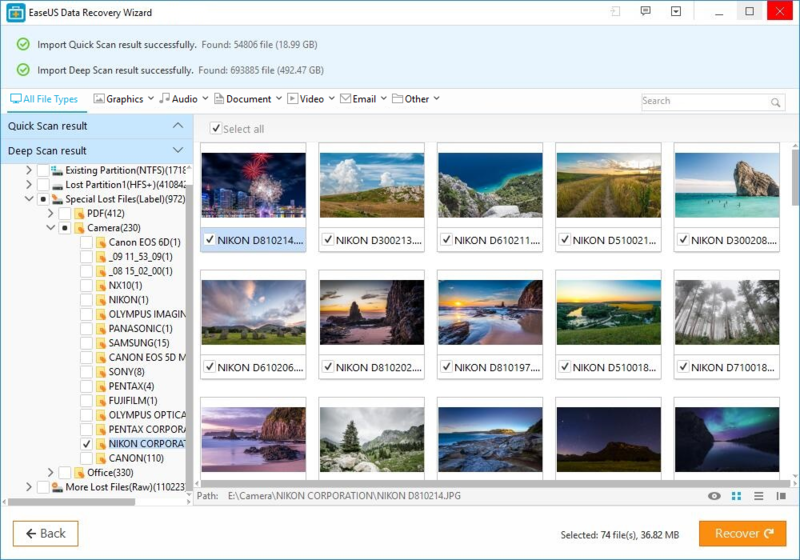 File types: Recover all types of lost files, including any photos, videos, audios, documents, emails, compressed files and much more or you can look through the file recovery software. Supported devices: Don’t worry about a specific device in which you want to recover your data because you can recover data from PCs, laptops, digital devices, hard drive(HDD, SSD, USB, etc), storage media, server, RAID etc. Lost Partition Recovery: As we have already mentioned this features above that you can recover data from deleted, hidden, lost or raw partition as well. RAW recovery: It can look through storage device in deep level for retrieving the lost files by scanning. Import & Export: You can import and export your scanning results to any other devices. Note: From the above list we have excluded the Free plan which is available for all OS here.